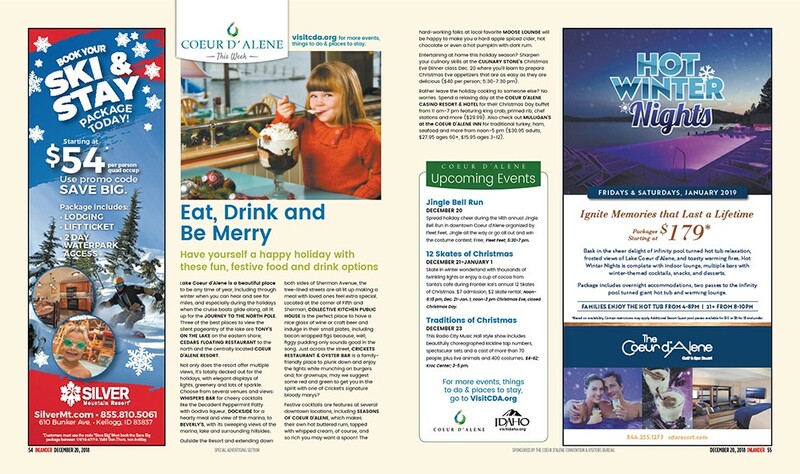 Lake Coeur d’Alene is a beautiful place to be any time of year, including through winter when you can hear and see for miles, and especially during the holidays when the cruise boats glide along, all lit up for the JOURNEY TO THE NORTH POLE. Three of the best places to view the silent pageantry of the lake are TONY’S ON THE LAKE on the eastern shore, CEDARS FLOATING RESTAURANT to the north and the centrally located COEUR D’ALENE RESORT. Not only does the resort offer multiple views, it’s totally decked out for the holidays, with elegant displays of lights, greenery and lots of sparkle. 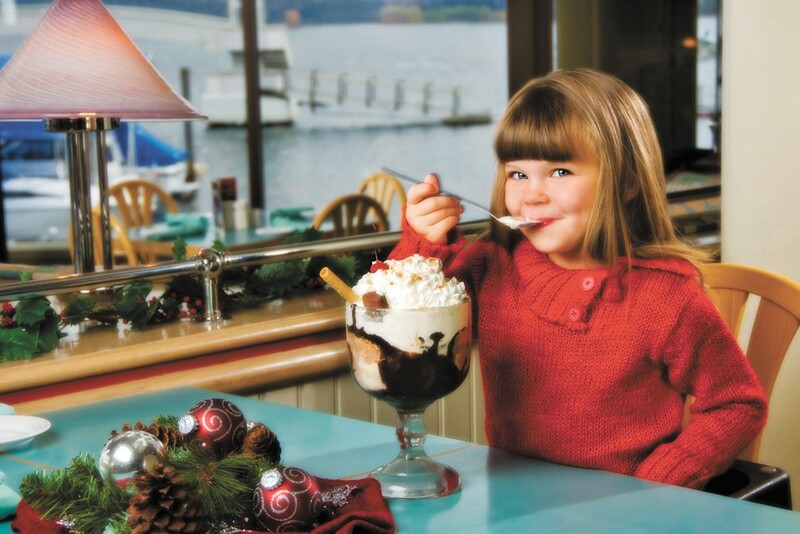 Choose from several venues and views: WHISPERS BAR for cheery cocktails like the Decadent Peppermint Patty with Godiva liqueur, DOCKSIDE for a hearty meal and view of the marina, to BEVERLY’S, with its sweeping views of the marina, lake and surrounding hillsides. Outside the Resort and extending down both sides of Sherman Avenue, the tree-lined streets are all lit up making a meal with loved ones feel extra special. Located at the corner of Fifth and Sherman, COLLECTIVE KITCHEN PUBLIC HOUSE is the perfect place to have a nice glass of wine or craft beer and indulge in their small plates, including bacon wrapped figs because, well, figgy pudding only sounds good in the song. Just across the street, CRICKETS RESTAURANT & OYSTER BAR is a family-friendly place to plunk down and enjoy the lights while munching on burgers and, for grownups, may we suggest some red and green to get you in the spirit with one of Cricket’s signature bloody marys? Festive cocktails are features at several downtown locations, including SEASONS OF COEUR D’ALENE, which makes their own hot buttered rum, topped with whipped cream, of course, and so rich you may want a spoon! The hard-working folks at local favorite MOOSE LOUNGE will be happy to make you a hard apple spiced cider, hot chocolate or even a hot pumpkin with dark rum. Entertaining at home this holiday season? Sharpen your culinary skills at the CULINARY STONE’s Christmas Eve Dinner class Dec. 20 where you’ll learn to prepare Christmas Eve appetizers that are as easy as they are delicious ($40 per person; 5:30-7:30 pm). Rather leave the holiday cooking to someone else? No worries. Spend a relaxing day at the COEUR D’ALENE CASINO RESORT & HOTEL for their Christmas Day buffet from 11 am-7 pm featuring king crab, primed rib, chef stations and more ($29.99). Also check out MULLIGAN’S at the COEUR D’ALENE INN for traditional turkey, ham, seafood and more from noon-5 pm ($30.95 adults, $27.95 ages 60+, $15.95 ages 3-12). Spread holiday cheer during the 14th annual Jingle Bell Run in downtown Coeur d’Alene organized by Fleet Feet. Jingle all the way or go all out and win the costume contest. Free; Fleet Feet; 5:30-7 pm. Skate in winter wonderland with thousands of twinkling lights or enjoy a cup of cocoa from Santa’s cafe during Frontier Ice’s annual 12 Skates of Christmas. $7 admission, $2 skate rental; Noon-6:15 pm, Dec. 21-Jan. 1, noon-3 pm Christmas Eve, closed Christmas Day. This Radio City Music Hall style show includes beautifully choreographed kickline tap numbers, spectacular sets and a cast of more than 70 people, plus live animals and 400 costumes. $4-62; Kroc Center; 3-5 pm.